I call this one PB & J(onnie) because Jon and I subsisted on brown-bag lunched on PB sandwiches for years, so this is my tribute to him. 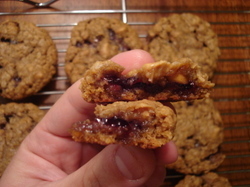 It's an oatmeal-peanut butter cookie stuffed with grape jelly. (I know...another stuffed cookie? I must be part marsupial or something.) The "J" in all my PB & Js has always been grape, but feel free to use strawberry or whatever jelly flavor you crazy kids are in to. My secret to this moist, flavorful cookie is ground-up Peanut Butter Cap'n Crunch cereal. I use only a 1/2 cup of smooth peanut butter because too much of it will severely dry out the finished cookie. And, ironically enough, the peanut butter doesn't have much game when it comes to flavor, but I prefer Skippy Roasted Honey Nut. Makes about 4 dozen. Pour 1/2 cup of grape jelly in a bowl and hold in the freezer until step 6. Remove the grape jelly from the refrigerator and stuff each dough ball (using the “Golden Girls” technique) with 1 teaspoon of jelly. Put the stuffed dough balls in the freezer for five minutes to firm up. Bake at 350º for 10-12 minutes or until golden brown. Remove the cookie sheets from the oven and let stand for 2 minutes. Then place cookies on wire racks to cool. Yay! I'm totally going to make these this week! Awesome! Let me know how they come out. I always liked my PB&J sandwiches with only the PB and not the J. It all works well together in this cookie though!